Although it is difficult to analyse, the body tells us when it is stable. Note here that the linkages (limbs and torso) are braced in the form of stable pyramids. The stool (a Flaghead, shown left) is a vital element as it is essentially fixed to the ground by the photographer's weight and forms the third apex of the base along with the feet. This is partly why the stool-monopod combination is so good for photography. The stability of the photographer, camera, stool, monopod is a straight forward exercise in mechanics. It you get the buttocks below the knees, that is more stable than having your thighs sloping down towards the knees. A lower position also enables you to widen your stance while keeping the soles of your feet planted firmly on the ground. In the image you can see the difference between a tall photographer and a short one. In this case the 20" Flaghead is much better for your editor (27" inside leg) than their 24" version which felt significantly less stable. The stool can be used collapse, in which case the 20" version drops to about 11" off the ground. This is remarkably stable even though the unspread legs converge on a point and the stool will fall over if you stand up. It is reasonably comfortable once you have got yourself set and stable. Member, Ryan Browne, sits on his Peli case at soccer matches, as well as getting his three cameras, lenses and sundry electronics into place (the wheels are a boon), it is a good firm seat and is waterproof as well. Standing with a monopod is less stable again, although some situations may demand that you operate that way (eg American football or rugby). How did we test all this? - easy peasy! We strapped a laser to the top of the lens and measured the camera shake by watching the laser spot moving up and down on a wall many yards away. 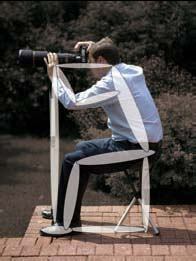 Using this method you can even see the movement created by mirror bounce with the camera on a tripod. There are some photographers who do not use support at all, preferring the freedom - that's for heroes only, some can do it - most cannot. !